New rules for flare stack combustion from the US Environmental Protection Agency (EPA) set to take effect in early 2019 include additional monitoring and analysis requirements that make it necessary for refinery operators to quickly and accurately determine the heat values of flare stack gases. Determining the heating values of vent gas is important because sufficient combustible material must be continuously present to achieve high combustion efficiencies. 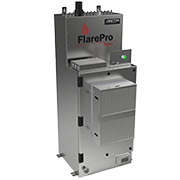 To assist refiners in making that determination, AMETEK Process Instruments has developed the FlarePro quadrupole process mass spectrometer. Accuracy Absolute Standard Deviation better than 25 PPM on 1% component, (e.g. 0.25% RSD for argon in air). Power 115/230 VAC, 50/60 Hz, 1000 Watts max. Ambient Temperature +12°C to +40°C standard. Optional cooling package available for higher temperatures. PC On-board PC standard. Windows®-based Process 2000 Software can also be run on remote PC.